It has been 1 year and 10 months since I joined the forum Stackoverflow, the Q&A platform for programmers asking coding questions. The people there are helpful (I tried to avoid using the word friendly since they are professional and critical). I have been fairly active in a few tags like r, Python and data harvesting related. 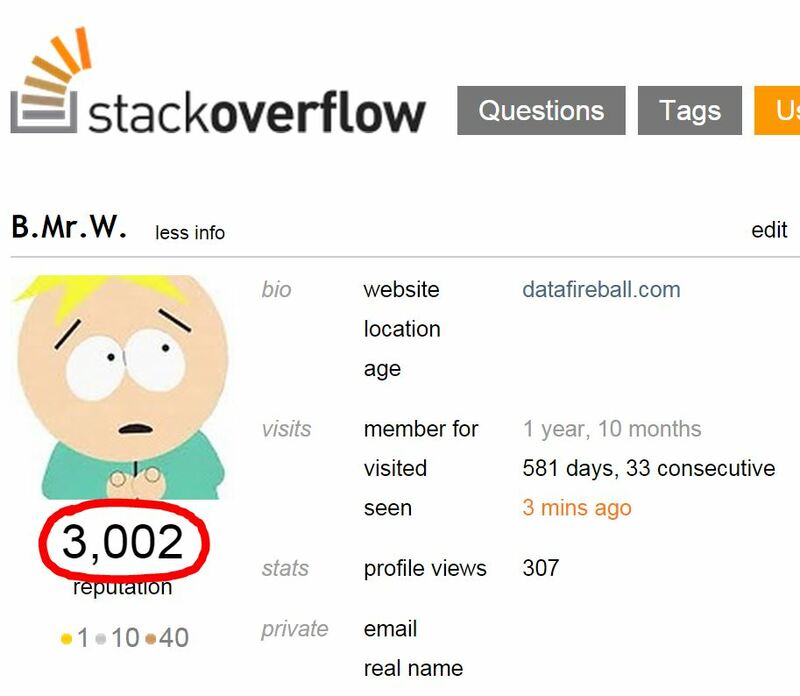 Today, it is a milestone of 3000 which is not only an acknowledgement for my activities in the community (174 questions and 130 answers), but also an evidence how the community helped me grow in my professional career. I don’t write diary but whenever I review my questions on stackoverflow, it reminds me of every project that I have been working on and sometimes I can even recall where I was while working on it, even with whom. Anyway, big thanks to the community and big thanks to myself, I will keep using stackoverflow as a tool to hone my skills!